Here’s Part 5 in our series on ISSW 2012, the International Snow Science Workshop, held last month in Anchorage, AK. As you can guess from the title, we think the future of snow safety lies in “human factors.” And we’re not the only ones. This area is where all the energy is right now at the leading edge of the avalanche industry. The idea is that having all the right equipment, training, and experience still isn’t enough to keep you out of an avalanche. There are a myriad of human factors that influence even the most experienced pros in the field, including peer pressure, competition, status, scarcity, goal-setting, and communication. These factors are often cited when seasoned experts end up in avalanches. 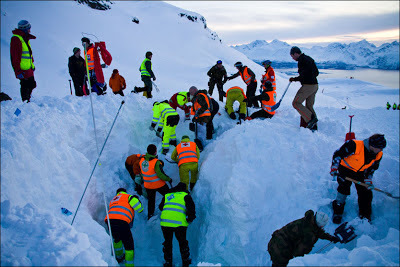 Edgerly summarized what he called the “evolution of avalanche rescue.” Up until about 30 years ago, rescue was focused on organized rescue: search and rescue by members outside that of the victim, using search dogs and organized probe lines. This was followed by the adoption of companion rescue and the use of beacons, probes and shovels to perform rescues within your own group. This has evolved into the era of self rescue, with the rapidly increasing use of avalanche airbags to keep yourself from getting buried. Edgerly said that, ideally, the next phase in this evolution would be “non-rescue,” where education and prevention drive down the number of fatalities. He said he thought the biggest opportunities for achieving this was through attacking the human factors and communication issues that so often result in modern avalanche fatalities. Edge presented the paper with support from co-author Paul Baugher, the patrol director at Crystal Mountain, with case studies provided by Colorado Avalanche Information Center forecaster/statistician Spencer Logan. As examples, they illustrated five avalanche fatalities in Colorado and two snow immersion fatalities in Washington and California that were directly related to lost verbal communication between individuals in the group. For details, read their ISSW paper on our research page. In each of these cases, the skiers, snowboarders, or snowmobilers involved lost sight of each other and weren’t able to establish verbal contact. This resulted in one person being unaware the other was buried, injured, or stuck in a tree well. Establishing verbal contact in each of these cases most likely would have prevented the fatality. What was Edgerly’s conclusion? That backcountry riding has changed a lot over the past ten years and “good partnering” has become more difficult. Skiers and snowboarders are riding bigger lines, more technical terrain, and not stopping as often to regroup and maintain contact. Combine this with an over-reliance on cell phones–and the resulting false sense of security–and you’ve got an epidemic of poor “real-time communication.” He lauded AIARE (American Institute of Avalanche Research and Education) and the CAA (Canadian Avalanche Association) for including progressive modules on group communication in their training curriculums. But he said there is still a technical gap that is not being filled “to address the issue of lost verbal contact when good partnering fails.” He called cell phones impractical in the backcountry winter environment and he called Talkabout-style two-way radios a great first step, but marginal with respect to their user interface and reliability in winter conditions. “So what does that mean? How are you going to improve this?” somebody asked from the audience. I have just posted this file from Bruce Edgerly VP of Back Country Access which he presented at ISSW 2012 Alaska. I may be biased but I tend to like the simple approach BCA take to education and they bring a lot to the table, this paper being no exception in my opinion. As mentioned in the paper we have moved forward from good organised rescue (often too late) to the immediate companion rescue which has a bigger impact on reducing morbidity and mortality. The use of airbags will also surely have in impact but I think we might be a long way from these becoming commonplace for all but the serious freerider and alpine touring party. European guides are more often now equipping clients (multiple burials on the uphill part of a tour being unfortunately frequent)with ABS rucksacks. accuracy is everything to survival and the ultimate airway opening device is a shovel. The latter app is undergoing some testing by the Chamonix PHGM/CRS but rightly the rescuers are keen to point out its in early stages and no substitute for beacon, shovel and probe. Given the terrain around Europes highest mountain, narrowing down the search area to even +/- 100m could help narrow down a search area for body recovery saving time. But that's a location app not an avlx app. I have briefly tested the SnowWhere app (charcoalfrost.com) and its basically just a glorified GPS location device. Accurate to +/- 10 meteres at best, which realistically in a circle is about 300 sq/meters which is a lot of probing, maybe 300+ holes. Glorious weather and time for an "off season". 36 races this past 7 months including some 96 + milers so I am feeling my age and tired. We had a great week in London and it's been nice to come back to such nice balmy weather. Long walks watching the last of the salmon running and enjoying the autumn colors along with the odd easy run to keep my legs working. Now is time to for me to think ahead to the coming ski season and avalanche & off piste training. I have a new wireless beacon park on the way from the states for Glencoe Mountain who have hosted the first UK on snow one for 3 years. BCA avlx kit continues to be developing and in my opinion is the best kit available. This years "Float" air bag systems are light and reliable and very good value. I was invited to join the faculty for avalanche for Scottish MR but sadly find that I simply don't have the time to give them at the moment due to work and family commitments. I might manage the odd lecture for them but can't help on their courses. I wish them well though as they have come a long way with training. My lecture commitments are less as time is less, but I am doing one local one on avalanche at the Clachaig in Feb 2013 sponsored by Mammut. I also represent ski patrol (along with Keith and Bill) on the new avalanche faculty for FIPS but this won't mean much work until the next congress in Canada. Ripping the powder - with an airbag! Myself and a few other pro level avalancher's and skiers continue to benefit from our ambassador roles for Anatom and Dynafit promoting this top brand, skiing the excellent kit and hopefully giving something back to Anatom who have done a lot for mountain safety by providing the beacon parks at Glenmore, Glencoe and Nevis Range. For you folks out there wanting Freeride kit its time to let me know as orders are going in. Dynafit is the very best and lightest and for off piste safety you just can't beat BCA kit. Rescuers maybe need to upgrade to the BCA SAR range of probes and shovels for prolonged searching. If your into the real steep and deep then you need "Preachers" from Whitedot. A couple of us locally are in "dots dozen" and can vouch for these fat boys. Some good results from the local riders with the lads doing a great time on the long course and Ben and I deciding to rip it up and go for a fast time on the 96 mile course. Both courses have lots of climbing with Ben and I clocking 4,500 ft. A nice way to end a great season on a well run local event put on by No Fuss Events and Chain Reaction Cycles.